A few moments ago, I was on the Arizona state legislature’s website to check up on a current nemesis, the minimum tuition bill that would get rid of need-based full-ride scholarships. While on the site, I found the bill and checked its status – nothing had changed. I checked the overview and its most recent action was listed as “2/15/12 W/D,” which indicates (to my knowledge) that the bill was withdrawn. Having not heard much, I perused local newspapers and asked the internet about it, so far to no avail. I called the original sponsor of the bill, but got no answer. For a while, the state legislature’s website was rerouting me to this bill, a bill from the previous legislative session regarding food stamps. Manually finding my way back to the current session, the bill still says it was withdrawn last week. I’ll update more on this as the day moves continues. 12:45 Update: It appears that the bill has been withdrawn from the Committee on Higher Education, Innovation and Reform, although I have not found out why. The Appropriations Committee, of which Rep. John Kavanagh is the chairman, is still scheduled to discuss the bill tomorrow morning. Including Kavanagh, six sponsors of the bill are on the 13-member committee. The HEIR Committee had no sponsors among its membership. 9:40 Update: Earlier this afternoon I e-mailed the original sponsor of the bill to ask about its status. He responded with a long list of reasons to support the bill, which I just finished criticizing here. Feb. 23 Update: The House Appropriations Committee voted yesterday to pass the bill after a very intense testimony from students and other stakeholders. It’s a sad move towards a potential equivalent to a $2,000 tuition increase for the poorest students in the state. An amendment was passed exempting students living on campus, but an exemption for veterans was not passed. Mar. 1 Update: The bill was withdrawn by Rep. Kavanagh yesterday! 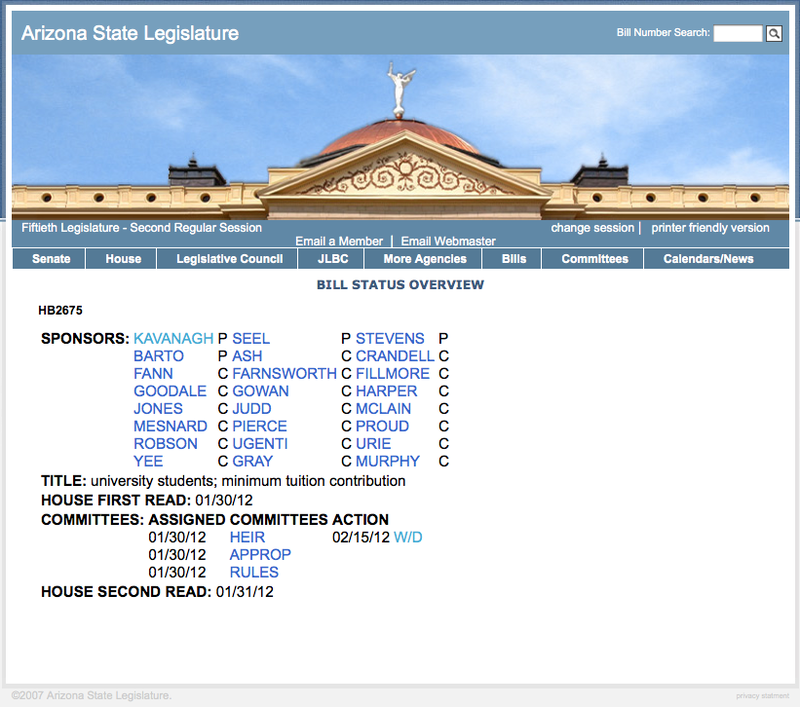 This entry was posted in US Politics and tagged Arizona, HB 2675, Higher Education, State Government, Tuition. Bookmark the permalink.